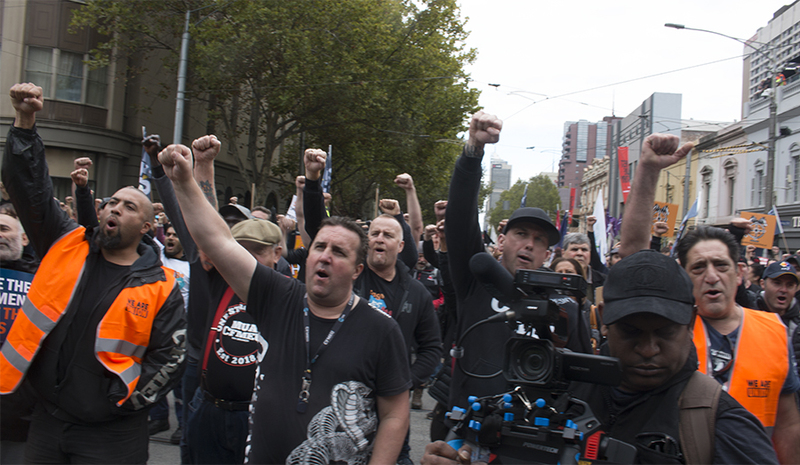 hoto by Joe Montero: A portion of the at least 150,000 who turned up on the streets of Melbourne. 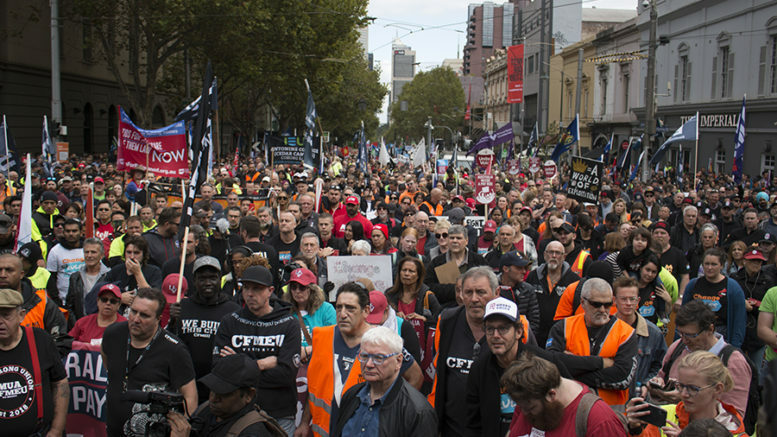 At least 150,000 union members and other Australians hit the streets in Melbourne to tell the Scott Morrison government that they are out to overthrow the present industrial relations system and fight for a fairer Australia. Anyone who was there would know that the mood is determined. 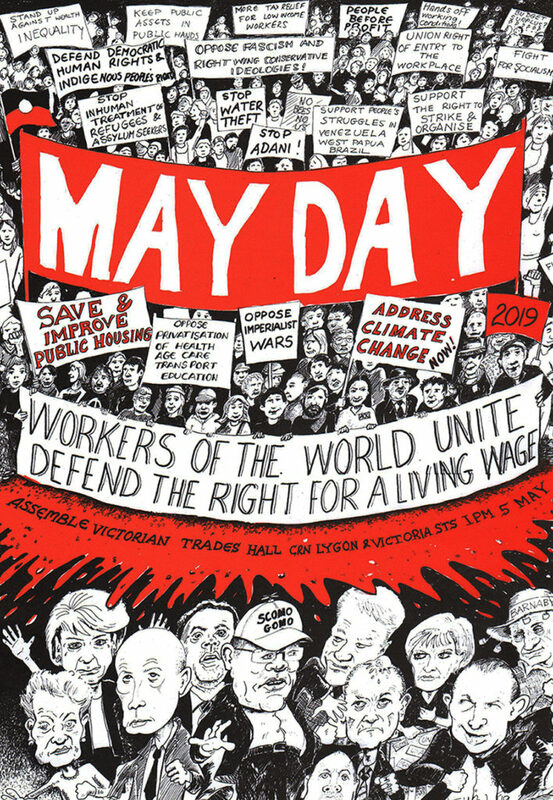 Nothing less than changes that will turn around the de-unionisation of Australia, and the associated fall in the wages share in Australia’s wealth, deteriorating working conditions, and the ongoing casualisation of work, which have been the reality for most Australians for decades now. The biggest fall in living standards for many decades has fallen on this nation. 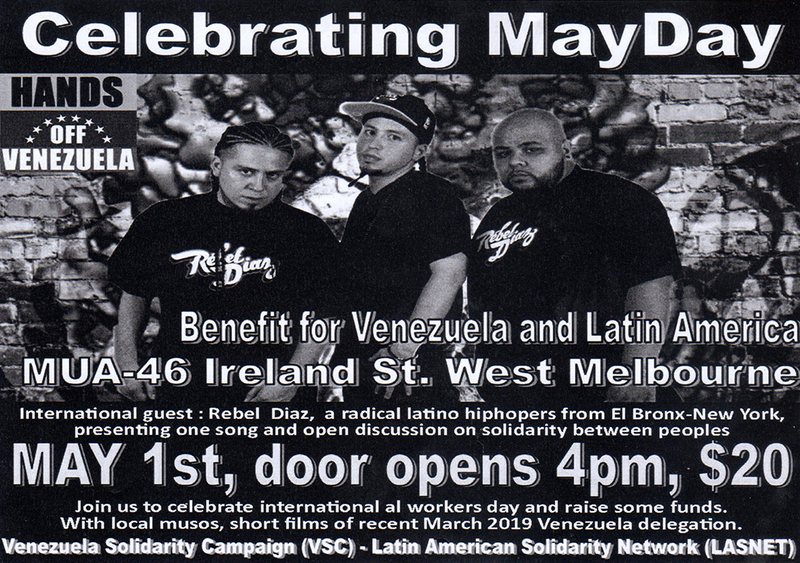 Marches and other events were organised for 14 cities and regional centres around Australia. 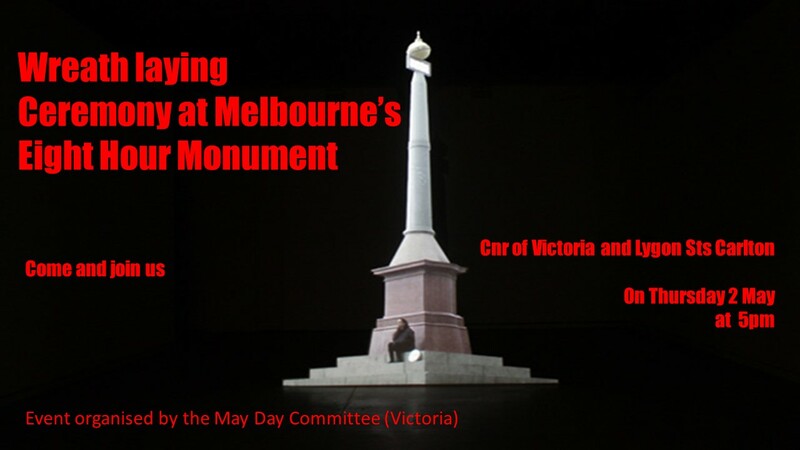 Scott Morrison and his government should be very worried. They face a movement from below, promising to throw them out of government. The most recent polls suggest that there will be a defeat at the coming election. This is no plot by union leaders, as a few would have it. If the conditions did not exist, only a handful would have answered the call to walk out of work and take part in a march. 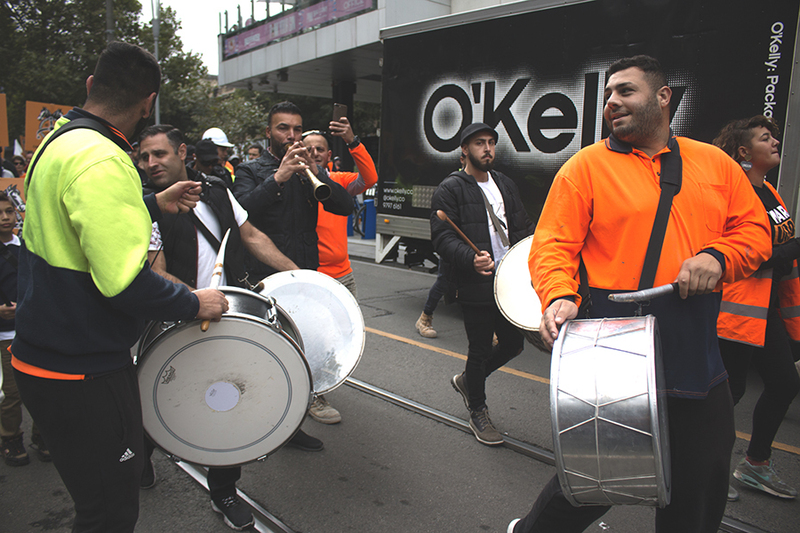 Construction industry workers even had to put up with the threat that they would be hauled before a hearing of the Australian Building and Construction Commission (ABCC) and individually fined tens of thousands of dollars. They came out in droves anyway. This prevailing mood for change is the biggest thing seen for a long time. There is an expectation that a coming in Labor government will deliver. 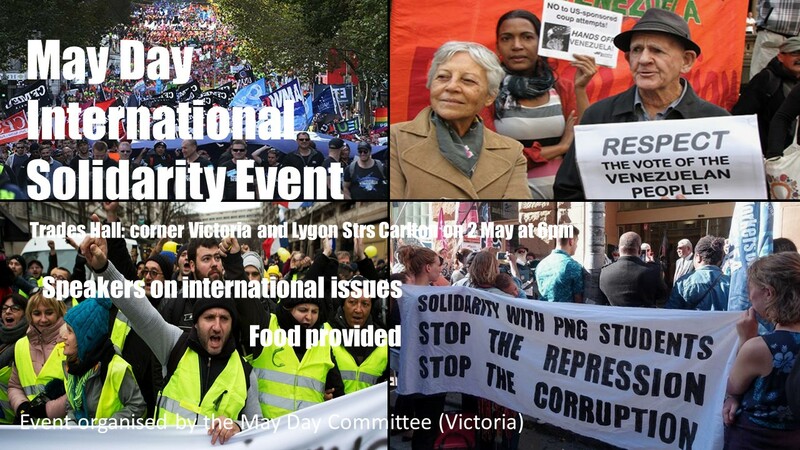 Unlike on the Aftermath of John Howard’s humiliating defeat, there is a greater realisation, that the movement built up in recent times, must be maintained after the election has come and gone. Working people need to rely on their own strength to ensure that justice is done. 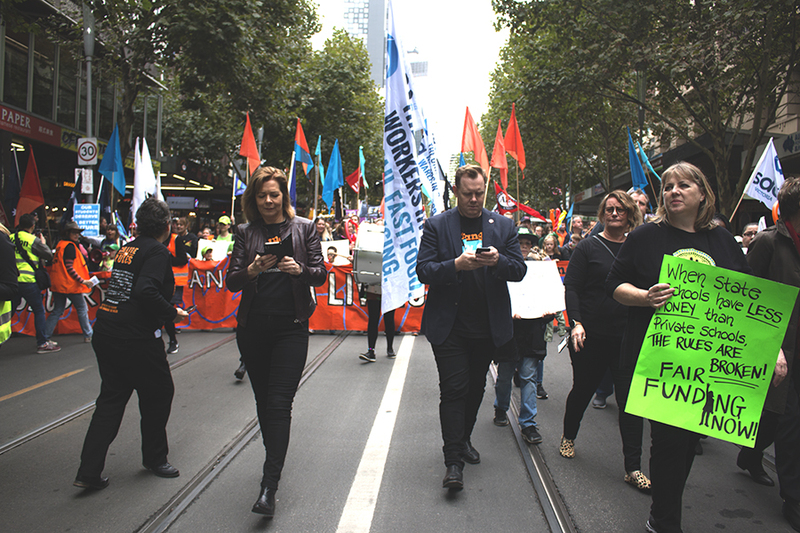 Melbourne’s march is documented through the photos below. Photo by Joe Montero: The kids were there too. It’s their future at stake. 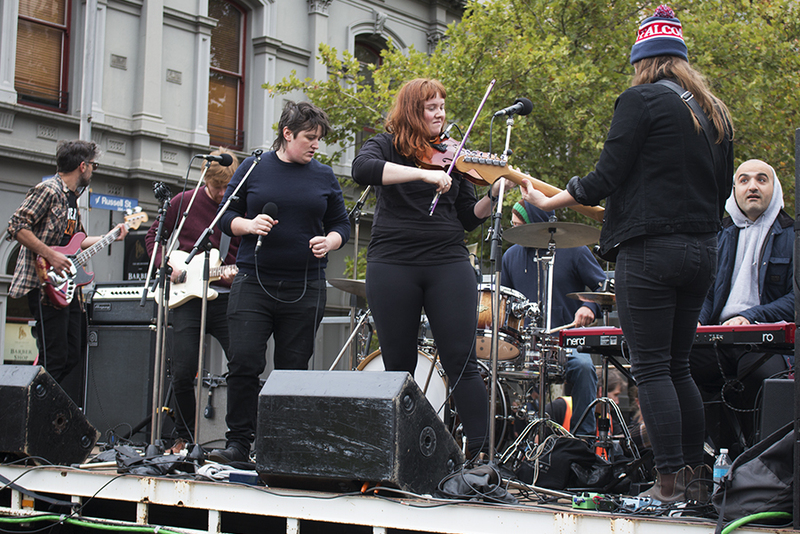 Photo by Joe Montero: March showed Melbounr’s cultural diversity through music as well. 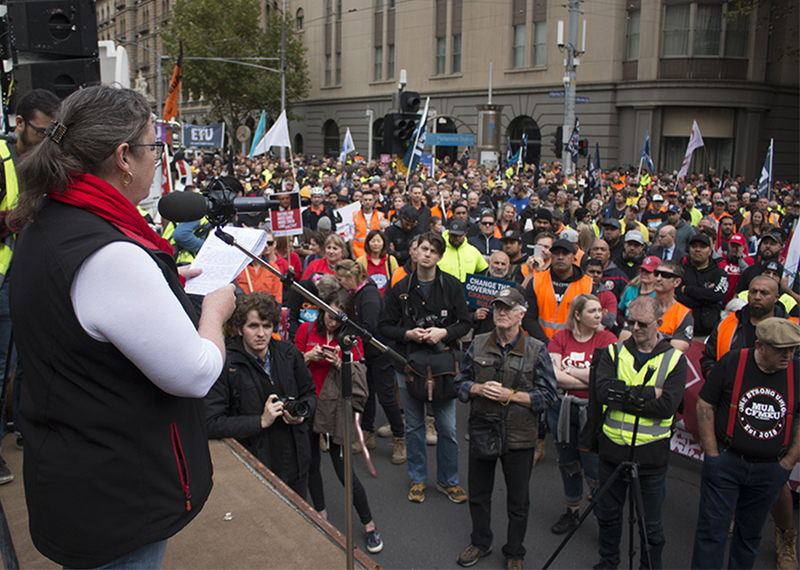 Photo by Joe Montero: Karen Batt Secretary of the Community and Public Sector Union speaks to the marchers. 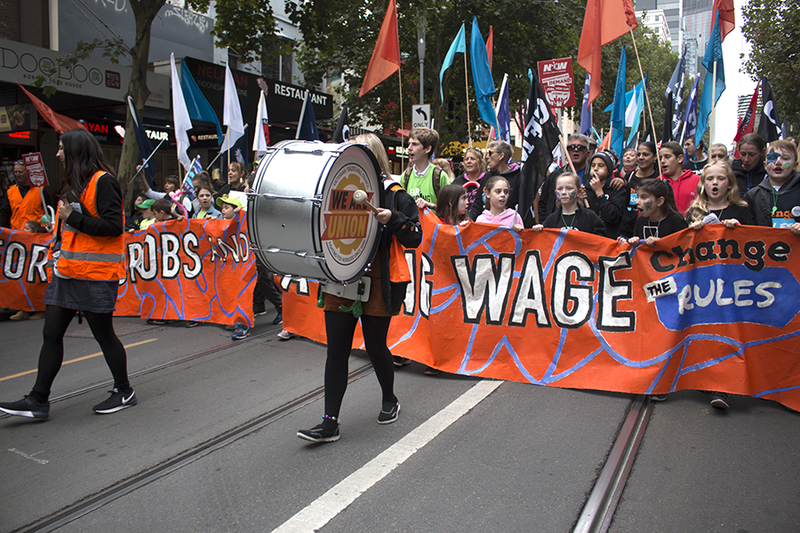 2 Comments on "Massive turnout in Melbourne marks Australia’s latest Change the Rules marches"
Is it their policy to call on Labor to introduce a maximum wage then gradually reduce it and to increase the minimum wage until the two are the same? 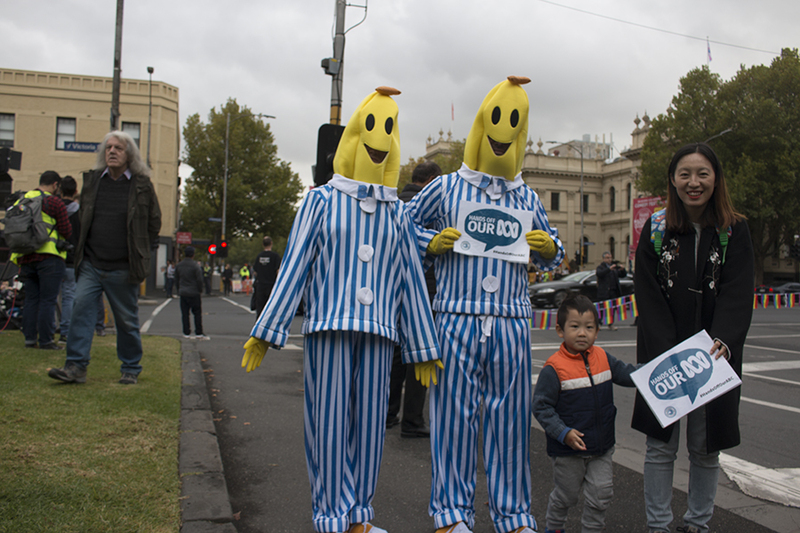 Melbourne still has some semblance of democracy and ability to have coverage in the media. NSW has voted that those in the Greater Sydney Region support a government willing to waste $2.2billion on destroying and rebuilding sport stadiums, and $1billion on destroying Newcastle CBD direct to Sydney railway for a light rail running alongside the ripped up rail line, while giving $75million for elite cycling business people in the Northern Rivers to rip up the much needed railway line for a cycling path! Insidious machinations permeating our councils, NSW government, non-government organisations, chamber of commerce, business collusion and even educational institutions are in on the privitisation of the railway land. Few have any understanding of the great need we have in the area in accessing our needs – in our close capital city – Brisbane. NSW government has deliberately made freedom of movement and association difficult for us, and aim to sell off all public transport. Your taxes are going to supplement private corporations. Think about that. Northern Rivers is just an exercise of the wealthy .01% gaining complete oligarchy in Australia – with nothing for the majority. It is not a local issue.